Relatively recently, “Strings” magazine has had articles interviewing players about characteristics of their respective instruments. They call it “What's in the Case”? As a confirmed fiddle fanatic, I have enjoyed these articles very much. These “Strings” interviews always follow a set pattern. They begin with a short assessment of the instrument, and the bow and strings the player uses with it. That is followed by a series of fairly set questions. I have decided to interview myself using almost the same format, and see what I come up with. There will be one twist, though. As I currently own about 10 violins, it's all I can do to limit myself to two, and may make occasional brief reference to others in my collection. ..and violin also by Vittorio Villa, anno 2011, Amati model. I will focus mainly on these two. Each of my 10 violins has certain unique qualities that the others don't have. I have 3 excellent violins custom-made for me by Edward Maday, 3 custom-made for me by Vittorio Villa, an excellent French violin by Desiré, anno 1854, a Peter Lam, a beautiful Chinese copy of the “Hellier” Strad, and a fine Chinese Strad model. You see how hard it is to narrow it down even to two? But lately I have been carving up the solo and chamber repertoire mostly between my del Gesu model Villa and my Amati copy Villa. Again, each of my 10 violins has something to offer. It's not that these two are absolutely better than the others on every note, in every register, in every piece of repertoire or in every phrase within a particular piece. But for my current tastes and playing style, these two seem to be the Decathlon champs. Physical Characteristics: The del Gesu model is freely based on the famous “Lord Wilton” del Gesu, which once belonged to Yehudi Menuhin. The overall modeling is fairly close to the original, though to my eyes, this original creation has a more Strad-like scroll in an otherwise del Gesu model. The amazing wood for the back, which we chose together, makes no attempt to even approximate the original. Rather than the more usual quarter-cut maple, this back is slab-cut with a broad and irregular pattern. The ribs are of matching wood. The varnish is red, shaded over a golden yellow ground, and softly antiqued. It makes a bold and beautiful statement. The Amati model, on the other hand, is a very close copy of the “Prince Youssoupoff” Amati, and includes elegant decorations very closely matched to the original, which are not painted on, but rather are inlaid – something very labor intensive. The varnish is a light golden brown with just a hint of worn red, very subtly antiqued. The scroll, and every other detail is done with great beauty and delicacy. It looks exquisite. Bow: I have even more bows than fiddles – 17 at last count! But for both of these violins and for two others, I use a wonderful bow by EA Ouchard, circa 1920's. Strings: Vision Solo (non titanium) – medium gauge. I just started to come away from the over-priced Vision E to the bargain priced, but very good Goldbrokat. But the medium Goldbrokat somehow feels a little thin, and I may try the stark next time. IS THIS YOUR PRIMARY VIOLIN? Right now, these two, the del Gesu and Amati model Vittorio Villa violins, are my primary violins for solo and chamber music. HOW DO THEY COMPARE TO YOUR PREVIOUS VIOLIN(S)? Juggling so many, I'll focus on comparing mainly these two violins. They are as different, tonally, as they are in appearance. The del Gesu model has a rich, warm, broad, round and vast tone, with a good deal of presence. Overall, it is on the dark side – especially on the lower strings, with more brightness on the upper strings, yet it all sounds of a piece. For example, the G has a richness and sonority almost suggesting a cello, the A and E are brighter and more cutting, but the strings do not sound like they belong to different violins. It has a lush, sensuous quality, a 'chewy' texture on many notes, and a noble tone. The Amati model is much brighter, with a good deal of brilliance and cutting edge. I've sometimes thought of it as a beautiful laser cannon in sound! The tone, especially on the lower strings, is leaner and a bit dryer – yet in a good way, kind of like a fine dry wine that makes your mouth pucker. It gives me the feeling of a great deal of harnessed horse power, just rarin' to go! When I play on it, there is an immediacy of response and a feeling that the sound is spinning out quickly into whatever space – large or small – that I am playing it. The sound of a violin often reminds me of other things, such as singers, other violinists regardless of what instruments they play, other kinds of instruments, wines, horses, cars, colors, flavors – even desserts! Accordingly, I will compare these two Villa violins in a respective way. The del Gesu model - Placido Domingo, Pinchas Zukerman, a French horn, a fine red wine, those Viennese show horses, a Rolls Royce, purple, maroon, chocolate, caramel, a delicious ice cream sundae. The Amati model – Pavarotti, Perlman, a trumpet, a fine white wine, a race horse, a Ferrari, orange, gold, citrus, a refreshing creamsicle. For repertoire, the Amati model would be my choice for the Mendelssohn concerto, Vivaldi's “Spring” and “Autumn”, Bach's E major Partita, and Mozart's 4th concerto, among others. The del Gesu model, I would prefer for most of the other Bach works, Vivaldi's “Summer” and “Winter”, Mozart's 3rd concerto, and concertos of Beethoven, Brahms, Bruch, Tchaikovsky, Sibelius, etc. In my recent unaccompanied recital program, in the first half, with the A minor sonatas of both Bach and Pisendel, I chose the del Gesu model, which fit better with the more somber and solemn characters of these works. For the more brilliant and glittering caprices that comprised the 2nd half, I chose the Amati model. The choices aren't always so clear-cut. I would have thought that the Saint-Saens Rondo Capriccioso would be best served by the Amati model, but I prefer certain passages of it on the del Gesu model. Similarly, I chose to play the Paganini caprice no. 9 on the Amati model. Overall it's the clear choice. But if I ever were to record it, I'd be tempted to use the del Gesu model just for those passages on the lower strings that are meant to suggest French horns. If I were to record the Bach Double Concerto by myself, I'd use the Amati model for the 1st violin part and the del Gesu model for the 2nd part. I do not mean to suggest at all that “first” means better here. Rather, that the Amati model would best fulfill the soprano role, and the del Gesu model would best fulfill the alto or mezzo role. 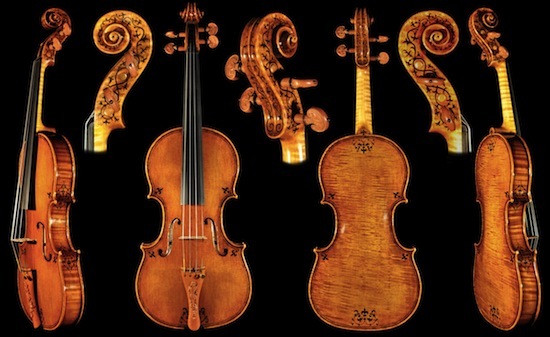 WHAT GIFTS DO THESE VIOLINS BRING TO YOUR PLAYING, AND HOW DO THEY INSPIRE YOU AS A PERFORMER? They help me both qualitatively and quantitatively. Their strength and projection give me the confidence to know that I can get the job done without over playing. And their colors help me to shape the character of the music. As new violins that I specially commissioned, their history and provenance begins with me! I do not align myself with one camp or another in the old-vs.-new debate. There are great and not so great old and modern instruments. But the past several decades there has been a real Renaissance of instrument and bow making throughout much of the world, and I am glad to be something of a patron of the arts in this regard! I can honestly say that my del Gesu Villa model bested the “Baron Von Der Leyen” Strad and a fine Guadagnini in opinions besides my own. My Amati model has a similar kind of incisive brilliance to the “Molitor” Strad, but with more bottom and more colors. Yet possibly the most beautiful violin I've tried so far is a particular Amati. When you hold an old violin in your hands you want to ask it “Where have you been? What stories could you tell if you could talk and not just sing?” That's an intriguing feeling. But a fine new violin yields a different kind of satisfaction. You hold it and wonder what its future will be. How will you both grow together? And if you commission a violin directly from a maker, to a significant extent you choose the wood, the model, the color etc. together. Little by little you watch it take shape. Then you start to bring it to life with your fingers and bow. I remember my first commissioned violin from Ed Maday. I went to his shop, we discussed various things and we chose the wood. To an untutored eye the pieces of wood we ended up with on the table were just pieces of wood. But we knew better. “There”, said Ed. “There is your new violin.” Two years later, it was! Ed and I are both in the New York area and he is an hour's drive from me. Vittorio is in Cremona, Italy. But we kept in touch by e-mail. Every commission has been a thrill! 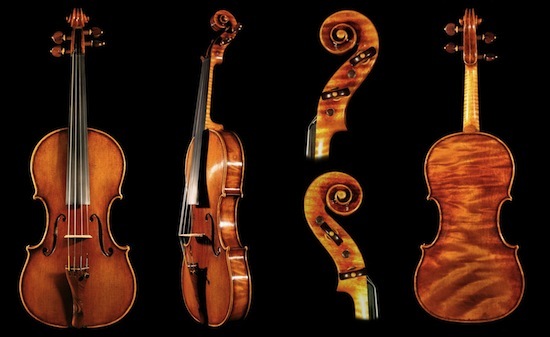 WHAT ARE YOUR VIOLINS' PERSONALITIES? My analogies earlier to cars and horses suggest some of their respective personalities – though they are more complex than any one or any several analogies can completely capture. But the Amati model does sometimes make me think of a race horse that just can't wait to charge out of the starting gate, or a great sports car like a Ferrari. The del Gesu model certainly has a lot of horse power of its own, but in a more dignified way. WITH SUCH DIFFERENT INSTRUMENTS DO YOU HAVE ANY PROBLEMS SWITCHING BACK AND FORTH WITH INTONATION, RESPONSE, ETC.? Switching is not without its challenges. And keep in mind that I have eight others right now! And I do give each one a certain amount of playing each week. Somehow though, it's fun for me, and it rarely takes more than a few minutes to be pretty much at one with the violin I've switched to. It's not an approach for everybody but it works for me. After playing the Amati model for a while and suddenly switching to the del Gesu model, the latter, though it now has all the core and focus I need, can initially seem just a tad lax in its tension in comparison to the laser-like incisiveness of the Amati model. In the opposite case, initially – especially in a small room as opposed to a hall - the Amati can seem a bit shrill. But again, these reactions are very temporary. It's not long at all in the switch before I revel in the rich sensuousness of the del Gesu model and the bracing, refreshing quality of the Amati model. WHAT ARE YOUR VIOLINS' LIKES AND DISLIKES? I find that all of my violins – including my 19th century one – are pretty stable. For a while, my del Gesu model Villa had a tendency to get a little soft in the humid weather. But since its last sound-post adjustment it's been a lot more consistently focused. DO YOUR VIOLINS HAVE ANY WEAKNESSES? Not really. If you want to be hypercritical you can always find something to pick on in any violin or any violinist, for that matter. I'm a very satisfied customer. HAVE YOU GIVEN YOUR VIOLINS NAMES? I've given almost all of my instruments names – including my piano and organ! Vittorio encourages his customers to give their violins names, and this becomes part of their record. Many customers name their violins after relatives. Ordering a custom-made violin from Italy, I thought of the classic artists of the Italian Renaissance. So I called my first one – a Strad model from 2009 - “Raphael”. (What can I say?) Then came the two violins I'm focusing on here. My Villa del Gesu model from 2010 is named “Michelangelo” and my Villa Amati model of 2011 is called “Leonardo”. HAVE YOU EVER DONE ANYTHING, SUCH AS REPAIR OR CHANGING STRINGS, THAT HAS ROBBED THE INSTRUMENTS OF THEIR “MOJO' – WHAT WAS THE RESULT? I don't believe that the “mojo” or special magic of a violin's sound is all that ephemeral. I have had adjustments made to all of my violins along with string changes. Together with lots of playing, their sound has only improved! “Michelangelo”, the Villa del Gesu model, has developed more core, focus and presence, along with the richness and warmth that it always had. I'd say it's now about 25% better than it was when it beat out the Strad and Guadagnini I referred to above. Earlier, I had compared “Leonardo”, the Amati model to a creamsicle as opposed to “Michelangelo's” ice cream sundae. At an earlier point I would have used the analogy of ices or a refreshing sorbet. But indeed, while “Leonardo” leads with the ices part of the creamsicle at the surface, more of the inner cream comes through as well. Both of these violins not only have fine, albeit very different timbres, but also a complexity that keeps me happy playing on them for long periods and makes me want to return to them. IF YOUR VIOLINS COULD TALK AND YOU SAT DOWN WITH THEM FOR A CUP OF TEA, WHAT MIGHT YOU SAY TO ONE ANOTHER? Well, I'd order the cup of tea. I think my violins would each order a cup of violin polish! Anyway, I'd like to tell them how happy and blessed I feel to have them in my life. I'd like to think they'd feel the same way! I wrote a similar "interview," if you will, using the Strings mag What's In the Case? format. It was fun to write. Most often the column focuses on an instrument that is 2 or 3 centuries old. I like it when they interview an artist who plays a newer contemporary instrument. Your Amati violin is gorgeous by the way. *How does this violin inspire you as a performer? If ever you sell the Amati model, it will be forever known as the Vittorio Villa ex-Klayman "Creamsicle". Seriously those really are beautiful violins. Congratulations on money well spent. lol! Yes, and the problem is that I have to keep both the creamsicle and the sundae in the fridge! But also seriously, as I said at the end, I really feel blessed - not only with these two but with the others in my collection. It's with mixed feelings that I decided to let the Peter Lam go and try to sell it. Each one really has a voice of its own. Thanks for this fascinating piece on your instruments, Raphael. What a beautiful pairing of two violins you have there. I am currently playing a very fine 2011 Lord Wilton model commissioned from Guy Harrison which has similar characteristics. I feel very privileged to own and play a new instrument of this quality. It sounded wonderful to me when it was new, but it has continued to grow richer and mellower in the two years I have owned it. It would be interesting to hear about your other violins and of course, the bows. Raphael, I've recently moved from the Goldbrokat medium E to the Stark (aka heavy) on one of my violins. I'm very impressed with the change in quality of tone, which seems to affect the rest of the instrument (late 18c German anon with a respectably strong voice). In particular, the Stark has a clarity and power at the top of the second octave (and over the rest of the string) which wasn't quite there with the medium gauge E, fine though the medium Goldbrokat is compared with many others. The tone doesn't break under pressure, either. The Stark has dark green winding at the tailpiece end and has, at the peg end, green winding overlaying the gold brocade. The other strings on this violin are Pirastro Chromcore A, and Vision Solo D and G, all with green tailpiece windings. Like Raphael, I've had good results from violins made in Cremona, but have preferred "new" to "antique" finish, leaving it to me to bash the fiddles up in my own good time. An early foray into this market involved giving a maker I met at an exhibition a Strad poster of the "Heifetz" Guarneri and asking for a violin on that pattern. It turned out well and I subsequently bought 2 more violins from the same maker. It helps to discuss wood and such before construction begins. The latest one was made on the basis of photos only of the raw timber. Yes, each violin has it's own voice, and yes, the "Guarneri" modelled one will make a more French-Horn sound on the lower strings. Your Amati model is very like an inlaid Stefano Conia "Louis XIV" I tried, part of Sean Bishop's 2012 Cremona Exhibition; beautiful and easy-speaking, but with less depth below the "G" string sound than a "Guarneri" will often give. Incidentally, I have a CD of Simon Standage performing on a decorated ANDREA Amati "Charles IX" (from the Tullie House Museum, UK) - it was found that "The pitch at which the violin was most responsive was at around a semitone higher than today's A=440" to quote Simon's note. Fantastic blog, you've captured the essence! Thank you for sharing your contemporary violins to the community. I used to be biased about contemporary instruments compared to antique instruments, but the more experience I've had seeing and trying instruments, that there are really wonderful instruments from every era and price range. Still, from every makers' generation, one has to be determined and lucky to find a great voice for their playing. The big difference is that we won't know until we are gone that which makers of today will be highly regarded in the antique market reflected in prices. In recent days, I have been very interested in the process of commissioning a violin. Did you go over with the various makers of every detail from aesthetics, sound, overall graduations as in very thick or thinner, and wood selection? Perhaps these things are to be discussed with every maker in trying to achieve the commissioned instrument the best desired results. But perhaps asking too much can take away from the inspiration of the maker doing the work. Maybe sometimes it would be good for the luthier to have some flexibility with the knowledge of some details. They are the ones doing what we cannot do, which is build a work of art. It would be interesting to hear from luthiers about their opinions on this. I really don't think massaging every detail with a maker has much merit. A player telling a good maker how to make, is a little like a maker telling a good player how to play. Set each free to do what they know how to do best. Thanks everyone, for the very nice and interesting feedback so far. I think that every customer and every maker has a different personality and a different way of working. Besides the 6 violins I've commissioned so far, I've also commissioned a carved wooden music stand and a piano bench to match my antique Knabe grand. I think that both customer and maker need to be somewhat open to one another and that even when the two have worked together before, there is always the possibility of misinterpretation and surprising results, which at first can seem to the customer to be not exactly what they wanted but when given a chance, can be quite pleasing. I cerainly would not presume to dictate to a violin maker how the archings or graduations should be. What I would do is try to articulate my tonal desires and the maker will take it from there. As to appearance, from the basic model, to the basic color to the degree, if at all, of antiquing, fittings, etc. that should be discussed. If you come to understand, for example, that a maker feels most comfortable with a certain kind of model, or preferring to antique or not, there's no point in the customer, if he wants something very different, barking up the wrong tree, or the maker trying to do something he's really not comfortable with. Also, I think there's some balancing leeway between complete laizee faire and micro-management. As my blog focused mainly on Vittorio Villa, let me talk a bit now about Ed Maday. I think that they are both excellent makers - out of a great many excellent makers that are out there today - and fine gentleman, and I really don't think that one is "better" than the other. It comes down to the individual instrument, and the 3-way chemistry between and among violin, bow and player. When I'd work with Ed, I'd drive to his shop and we'd discuss all kinds of things. When it came to wood he'd offer me some choices, based on the sound I told him I was looking for. I always told him that for me, acoustics trump appearance. When it got down to two choices, I would ask Ed if he thought that both would probably serve what I was hoping for tonally. Only when he'd say "yes" would I make a choice based on what look I preferred. Here is the story of the 3rd and most unusual violin Ed made for me in 2011, shortly before Vittorio completed "Leonardo". From my original idea to the way it ended up, you'd think that I was talking about 2 or more different makers and customers! At first, it took us a while to agree on something that we both wanted. But by that point we'd known each other for a long time, had a warm and friendly relationship, and really wanted a project that we would both enjoy. Ed feels most natural making somewhat free models based on del Gesu. The 1st violin he made for me was along the lines of the "Lord Wilton", anno 2007. (I call it "Wilton".) I made my 2nd CD with it. The 2nd one, anno 2008, was a closer but still somewhat free copy of Paganini's del Gesu, which Pag called "Ill Canonne". (I call mine "Ill Canonne Secundo") I've performed public solos with it. When it came to the 3rd commission I had been admiring at the time the "Plowden" del Gesu, and asked Ed if he would be interested in copying it. At first he said yes, but after some time he told me that he didn't find the "Plowden" too personally interesting to him as a model and would sooner do a copy of the bolder "Ole Bull". I told him that the "Ole Bull" did not appeal to me. We left it for a while and Ed finally told me that at that particular juncture he would prefer to make a freer model, and not copy any particular classic instrument. I said that was OK with me, but could I have some imput on certain details? He said "sure". He asked what I was looking for tonally. I said, "well a combination of the best of the first two would be nice!" He said he'd try, in terms of arching, graduation, various cuts, etc. Then having agreed to his basically having the freedom of the basic model, he was most open to some unusual details I asked for. Ed is a very good carver, and also makes viols, viola d'amore and other kinds of instruments. He also made a beautiful presentation, old style double case for me out of mahogany to house the first two violins he made for me. (The 3rd rests comfortably in an antique Hill case.) I'd always wanted one violin in my collection to have a lion's head instead of a scroll, a la some Stainers, and Ed said he'd be glad to. I also asked him if he might be up for putting a gold-leaf Latin inscription on the ribs, a la some Amatis, and Ed said that he thought that would be fun. I came up with the motto, IN MVSICA FELICITAS (in music, happiness.) I asked him if he could varnish it the way he had done with a viola d'amore of his that I admired, and he did that too. The result may not be to eveyone's taste, but I absolutely love it! If there is one violin in my collection that I wish I could have made myself, it would be this one, which I call "Lionheart". And the tone? Well it sounds nothing like its predecessors, but wonderfully like itself, dark and chocolaty. Back to dessert analogies, if I could translate the taste of a delicious chocolate moussse into violin sound, this would be it! A little soft and sweet at first, it has gained quite a bit in power, clarity and projection as well, and is a viable solo instrument. So, be open to possibilities and with some mutual trust and communication, wonderful things can sometimes happen! David, you are certainly right in that aspect, thanks for your opinion on the matter. I agree that players need to let the makers do their thing when commissioning. I was curious to know how makers would feel about a control freak commissioner! Maybe put them at the bottom of the waiting list? Commissioners need to pay deep respect for those building beautiful works of art for us. I had commissioned a bow from Robert Morrow in 2012, and aside from weight, balance, and color preference for the wood, I didn't feel the need to make additional requests from him. I just trusted his skills and intuition, and as a result, he commented to me that he did some of his best work based on the collaboration. I got to know Robert on very good terms after meeting with him several times. I was already familiar with his work, having seen and played examples, so I knew what to expect in terms of general feel from the maker. Every time I take the bow out of the case, I'm reminded briefly about him making the bow for me. This inanimate object has a profound effect on my livelihood. Raphael, your observations about working with the maker are good to hear. Gauging what they are comfortable with, in addition to how much collaboration they are interested in are certainly varied from individuals. Your story about Morrow kind of reflects my own feelings. Though I'm a maker, I've commissioned an instrument and bow or two from other makers. About all I asked was that they do work which THEY would be most pleased with, and was in the range of their typical working style. That's how one can draw on the highest level of experience of a maker, I believe. If I didn't believe I could keep hands off and get outstanding results, I wouldn't have chosen that maker in the first place. What I would NOT do is buy from a maker who I thought needed any coaching from me. If I deal with them, it's because I already believe them to be accomplished artisans in their own right. As someone who creates cases to special order almost exclusively, I can see where both Raphael and Davide are coming from on this. For me, it’s always a challenge to work with a client with a clear idea as to create something original and new. Granted, making custom cases allows more freedom ofaesthetic creativity than making violins to order, which is the reason I eventually stopped making violins. Sometimes clients have wonderful ideas, and it’s a pleasure to work together. I’ve done projects for people with degrees in design and art, and they’ve done their homework before contacting me. It’usually just a question of adapting the ideas to the medium, and the learning process involved becomes reciprocally beneficial. Other times clients don’t have such a clear idea, or they have ones that when translated into reality might not end up satisfying them. It’s my job, in this circumstance, to gently coax them with my professional experience to accept a compromise that in final analysis they will end up preferring. Occasionally a client will say, “you have carte blanche”. These people usually own already one or more of my works and so I know their taste as they know mine, a good premise for a happy ending. Lastly there will be the special, demanding project that needs, on my part, that sort of divine inspiration mentioned by architect Mies van der Rohe, without which I simply cannot make progress. These endeavors can take many months when not years, because until that special spark of understanding comes, I feel it’s best not to proceed. Yes, there is a range of working styles with both maker and customer, and there isn't necessarily any absolute right or wrong, as long as both maker and customer are happy working together. I hope I captured the latter in my post above, which was true, despite our not immediately being on the same page. As is typical with the completion of a violin Ed included a separate "Certificate of Origin" and a separate insurance letter. The certificate had a lot of details about the violin, photos, etc. But among the details was something unusual and unexpected: "In respect to wood selection, decorations, varnishing, and direction of sound, Mr. Klayman was very helpful in a most pleasant way." That made me feel so good! It's not that he needed coaching, but this was a special project - for all I knew, maybe the last violin I would commission from anyone (till I win the lottery!). You're right of course that there should be a range of say-so. It should be dictated by reason and professional experience on both ends of this range. Say a client comes to a professional and wants something truly outlandish or impractical. The client thinks he knows what he wants and is willing to pay for it; however the maker knows that the end result will not only be unsatisfactory, but it will bear his name forever! Thought I'd shine my flashlight a bit further on my collection. I was glad in the main body of my blog to feature two of my favorite fiddles, but as I said even then, each one in my collection has something unique. I will still say that in one sense I feel that I can carve up, and in the past couple of years have been carving up, most of the solo and chamber music repertoire between them. But if I've given the impression that in every way they are absolutely the twin peaks in my collection, with all the others falling into respective places in a clear hierarchy, it's not as simple as that. On April 18, I will be performing the Bach Double with a fine colleague, Michael Gillette, long time member of the Mostly Mozart Orchestra. Today we had our one private rehearsal, and it was very productive. Next week we will have 3 rehearsals with a professional orchestra in Monmouth University and of course, the performance. I will be playing second - or as I see it, the mezzo role, and using "Michelangelo", the Villa del Gesu model. (I forget Mike's exact violin, having asked him a long time ago, but it's some kind of fine modern Italian. At the start of the rehearsal, he mentioned that his bow needed reharing, leading to some bow talk. Turns out that by coincidence, he's using an Emile Ouchard, pere, and I, an Emile Ouchard fils!) But in my practicing earlier in the day, doing some thinking and experimenting, I decided that my closest second choice for the mezzo role in my collection would be "Lionheart", my Maday, lionheaded, Latin inscripted violin. And so, "Lionheart" will be the close 'understudy' for this project, and will accompany "Michelangelo" in a doube case, rather than "Leonardo", the Villla Amati model and usual double-case mate. So it all depends on the situation. As I said above it's not an approach for everyone. Many great violinists, such as the wonderful Hilary Hahn with her Vuillaume, have been and are happy to play exclusively on one instrument. Perlman alternates on his Strad for 6 months and his del Gesu for 6 months. Kreisler, Accardo, Nadien, and Elmar as he explained in the excellent interview here, have enjoyed switching around more. For me, collecting and switching around is a lot of frolicking, fanatical, fiddle fun!